coffee and pretty, little dreams. Can I just say how much I miss third wave coffee? Enjoying a cappuccino while I write. I know I mention starbucks alot when I write. I know I’m there kind of a lot. I know I shamelessly defend my right to be there. But the truth is that despite the pretty jazz music, nice atmosphere, and how legit I feel while writing there…I really don’t love their coffee at all. I really don’t even feel like I’m at a “Coffee Shop” I mainly feel like I’m at “Starbucks”. I also know that I have access to an awesome bar right across my driveway. Who doesn’t love their church owning a coffee roaster? I probably take that for granted, and by that I mean I do. But you know being part of the internship puts a lot in you and takes a lot out. So sometimes you just need that “other place” to be. So at the moment I am dreaming about on of my favorite coffee shops. It’s little and tucked away down a cobblestone alley called Nikels Arcade…The walls are painted blue, and lots of lovely people from Ann Arbor come to get their coffee and then it’s off to teach or attend class. The University of Michigan is close by…and Comet Coffee is pretty popular…The line is often out the door, but moves quickly. Comet’s baristas are so welcoming, they make good coffee and good jokes. People are just happy. Not to mention the cute northern style everyone wears…Hiking boots, wool socks, winter colours, frizzy-ish hair…it’s all part living in Michigan. 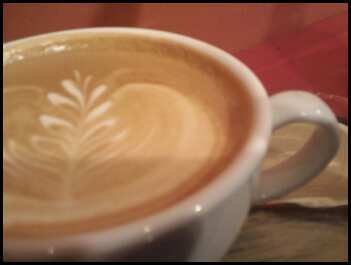 So if you ever are in Ann Arbor, Michigan stop by an order a cappuccino. Someday I hope to write for a magazine or newspaper…I hope to be working on my little laptop at a little blue coffee shop. I know those are pretty little dreams…So support print media.